Have you fallen in love with a pattern, only to find that it doesn’t come in your size? A few ladies told me that Itch to Stitch’s patterns don’t come in their sizes – some are smaller and some are larger than the measurements. Perhaps you have a tween who is not quite big enough to wear adult sizes, but too big for kid’s patterns. Perhaps you have a paper sewing pattern whose size range is just outside of yours (paper patterns come with one size range in an envelop, e.g., 6-8-10-12-14 in one envelop and 14-16-18-20-22 in another). There’s no need to despair. 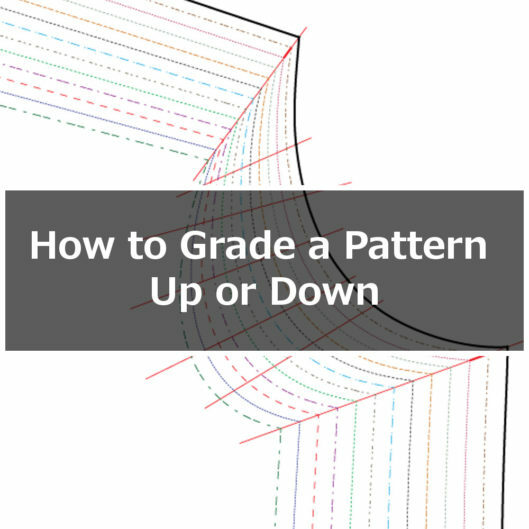 With a little time and some effort, you could grade the pattern up or down. This method is a pretty safe bet to change up to two sizes. The caveat is that the pattern must be evenly graded. What does “evenly graded” mean? It means at any specific point (let’s say, the waist), the measurements between sizes are the same. You see that each waist measurement is 2 cm larger than the previous size. However, it doesn’t mean that every point on the pattern must increase by the same amount. In fact, it’s likely that it doesn’t grow by that same absolute amount. Think about when a person gains or loses weight, some part of her body would increase/decrease more than others. And no matter how much weight she gains or loses, she wouldn’t be taller or shorter. In the example, while the waist still grows 2 cm per size, the neck to waist length only grows by 0.25 cm per size. This is typical of women’s patterns. The “big guys,” such as Burda, Vogue, McCall, Butterick and Simplicity, all have evenly graded patterns. The indie pattern companies, such as Jalie and Silhouette also evenly grade their patterns, although some patterns have huge size ranges, so they may evenly grade only within a sub-range. For example, misses 8 to 16 are evenly graded, and women’s 18 to 24 are evenly graded. As long as there are three or more sizes graded evenly in a pattern, you can still deploy this method. Some of Itch to Stitch’s patterns are not completely evenly graded across all the sizes. For example, in Lisbon Cardigan, the larger sizes have increasingly longer bodice, whereas the smaller sizes have the same bodice length. However, because there are more than 3 sizes in one range, you could still use this method to grade up or down. So maybe this is an unnecessarily long-winded explanation. Most of the time, you can use this method anyway. Step 1: Determine how many sizes you need to go up or down. This is body measurement table for most of Itch to Stitch’s patterns. Notice that for each size, the bust is increased by 1 3/8″ (3.5 cm), the waist by 1 3/8″ (3.5 cm) and the hip by 1 3/8″ (3.5 cm). These figures happen to be the same, but they don’t necessary have to for other patterns. Are you grading one size smaller/larger? Or two sizes? Step 2: On the pattern, draw a straight, guiding line to connect the “corner points”. Step 3: Measure the amount between sizes along each line. If you don’t have too strong of an aversion to the metric system, I think it’s easier to use millimeter (smaller unit is easier). But either way would work. I am going to use millimeter here. Step 4: Plot the next size (or next two sizes) using the measurements. The same logic applies with grading down. Step 5: Repeat step 2, 3 and 4 along curves. More plots along the curves make it easier for you to connect them smoothly and accurately. There is no absolute number of lines that you need to follow. You can do it sparingly but enough to make you comfortable with drawing the curve. Try to have the straight guiding lines perpendicular (the right word is probably “tangent”) to the pattern lines but you don’t have to be insanely precise (we are increasing/decreasing one or two sizes). You don’t need to draw more straight guiding lines along the straight part of the pattern lines; those are easy to connect. In the following example, I am going to continue on increasing one size only, but you get the drill of increasing two sizes or decreasing a size or two. Step 6: Connect the dots as smoothly as you can. Repeat for each pattern piece and there you go! I hope this is helpful. Keep stitching! You find the size that corresponds to your bust and the size that corresponds to your waist. Draw a very gentle curve from one size in the bust to another size in the waist. Make sure the transition of the line is very smooth. Dress is not finished yet, but without this tutorial, we wouldn’t be sewing this dress at all. Thank you again! 🙂 You made our day! Awesomely useful – thank you! Hi Claudia, you don’t add seam allowances. The pattern pieces you start with already have them (unless you are grading a pattern that does not have seam allowances, like from Burda). It depends on the year of the vintage pattern. Do you wear an 8 ready made or an 8 pattern. Pattern sizes do not correspond to ready wear adzes. I wear a size 14 pattern and a size 8 or 10 ready made . I am trying to expand some patterns for my granddaughter. She will be 8 in January and she is a size 9 in height and a 12 in the bust and waist so she is what i call chunky. is it possible to print these instruction out so I can understand and make notes on them. Hi Suzanne, yes you can print the post out for your reference. Hope it’s helpful! Do I need to download anything because when I tried to print it nothing came out. I am not sure Suzanne. I think it’s the way the browser talks to the printer. All I can suggest is to try another browser and see. If not, you might have to save the link and come back to it when you need a reference. Very clear on the whole. But I was confused why the red lines coming down from the new black dots along the curve are angled the way they are in Step 5? Whey do you need the red lines, don’t you just need the dots to then draw the new curve in Step 6? Thanks. Hi Hibi, those red lines on the armhole curves are to help you to draw the new armhole curves. With a straight red line, you know the distance between size 18 and size 20 at that specific point in the armhole. You use that distance to determine where the black dot is for your new size. Imagine if you don’t have that line, you could make that new black dot, for example, 20 mm away from the previous size, instead of, for example, 6 mm, which makes the armhole really “wonky”. I decide the angles of those straight lines by approximately making each tangent to the curve. But you may notice that they are not exact, which is OK because we are only increase (or decreasing) a size or two. Hi, is it possible that you mean you make the red lines ‘perpendicular to the tangent to the curve”. I believe the tangent would be closer to parallel to the curve, especially for the larger sizes. Thank you for the explanation of grading. Can you comment on how many sizes this would be accurate for? For example, would grading from the largest size, 20 , to 30, or five sizes, be true to size, or would there be distortions with that big a change? Excellent, added a few more fine tuning to my grading knowledge. Also, I’d like to mention that I appreciate on your Itch to Stitch patterns that the grading seems to be in smaller increments (than other commercial patterns). So it is easier to get a great fit!